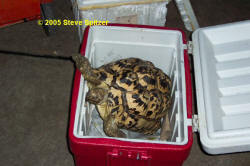 This is an account of how our leopard tortoises are kept in Chicago. It is not only about keeping the tortoises in the Snow Belt, but also about keeping them in an urban setting. 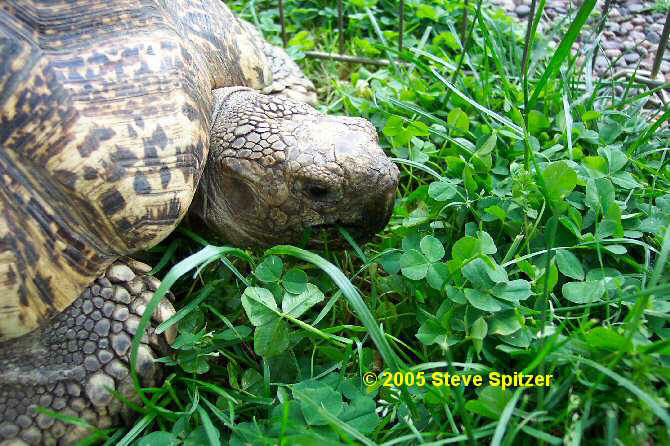 Although Snow Belt tortoises can only be kept outside for a few months during the summer, I find ours do well being put outside to graze and exercise as often as possible. On cooler days this may be only for forty-five minutes or so. They are not put outside if it is cool and damp out, but can take an hour of temperatures in the mid-60s as long as the sun is shining on them and it is not windy. I determine how long it is safe to leave a tortoise out by watching how long it eats. The smaller ones cool down and stop eating sooner than the larger ones. When they stop eating they are put away. 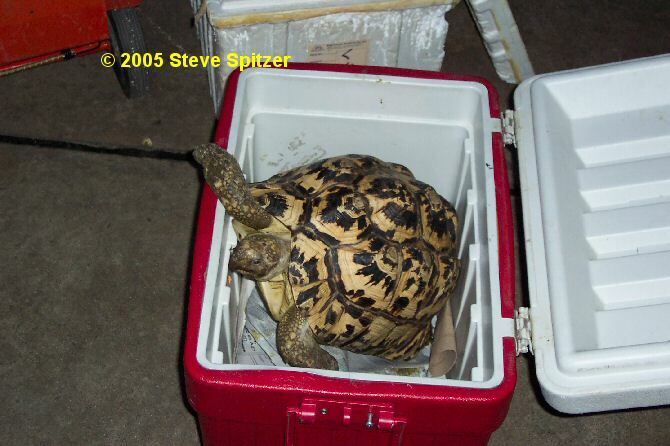 We do not currently leave tortoises out overnight due to concerns about theft, but did at one time. When they stayed out overnight we had plant growth so thick it was hard to find the tortoises and they dug right into the thickest plants for night protection. Low spreading bushes like spirea are good bushes for tortoises to hide under. So are tomato plants, at least until they are trampled. Areas where tortoises go may get chemical fertilizer without weed or bug killer in the fall after the tortoises are through going out, but no chemicals are used during tortoise season. 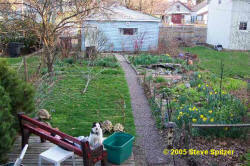 Garden and lawn additives used now and then are lime (for calcium), fish emulsion and liquid seaweed. Plants most often consumed outdoors by our tortoises are grass, sedum, dandelions and plantain. Our yard is small and would quickly be stripped bare if the tortoises were allowed to eat whatever they wanted, so some areas are fenced off and portable dog fences are usually used to contain the animals. These pens come in eight foot lengths, and two of them tied together with bungee cords can contain a couple of tortoises. They can also be easily moved so the tortoises can mow different parts of the lawn. 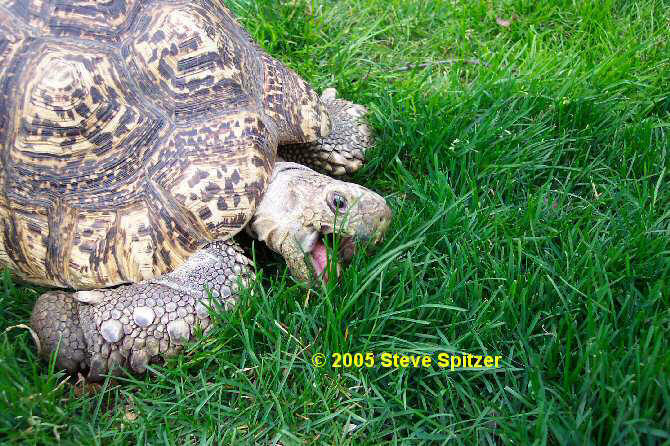 Because the grazing is limited the tortoises are fed imported weeds and tree leaves. 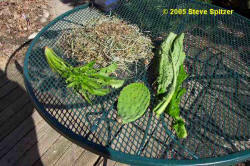 Mulberry and grape leaves are picked for the tortoises as well as long rough grasses and more dandelions and plantain. 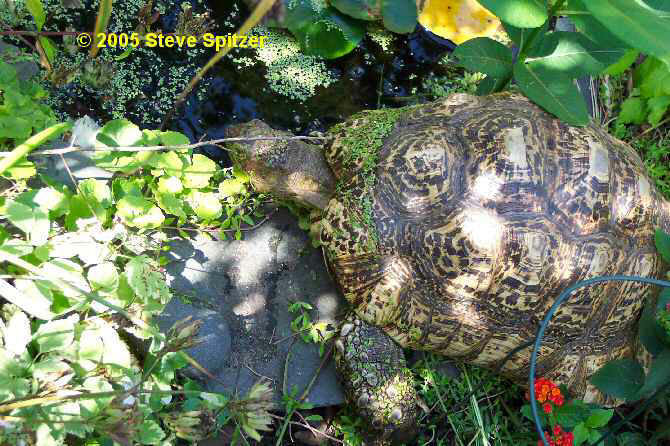 There are other flowers and weeds fed to the tortoises in small quantities, spent hibiscus family flowers, spiderworts, dayflowers and unidentified little weeds that they find. Our goal is to provide as much variety of growing plants as possible during the warm months. When it is too cold for the tortoises to go outside but before the first hard freeze, I pick grasses and weeds for them and mix with fruit market greens. I should note that I am careful where plants are picked. We not pick plants from places where plants might be exposed to lawn or garden chemicals, and we avoid industrial and high traffic areas. Although fruit is not recommended for leopard tortoises, mine have no problem polishing off watermelon or an occasional cantaloupe during the summer. 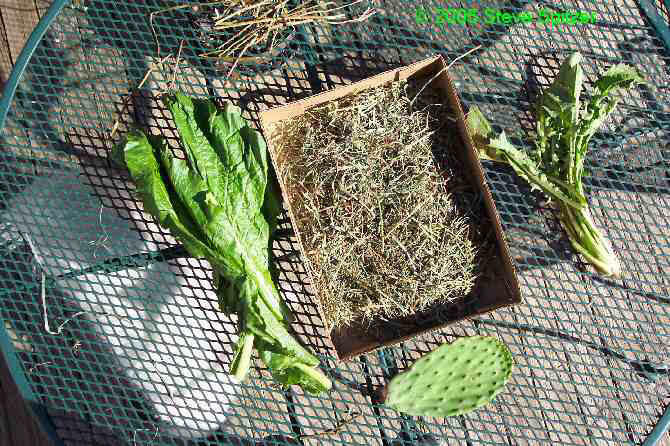 After the first hard freeze, sometime in December, I start mixing whatever weeds and grasses I have in the tortoise fridge with hay and fruit market greens until the weeds and grass are used up. From that point until spring the tortoises are fed hay and fruit market greens. 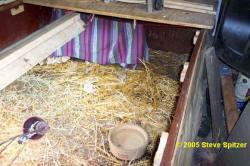 The hay used is timothy hay from the either a pet store or from the feed store. The feed store hay is called timothy, but has a few other types of grasses mixed into it along with clover. 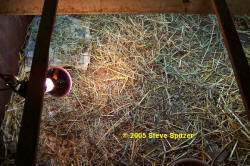 They are also fed alfalfa hay often as a small amount added to the other hay. The most often used greens used are dandelions (Greek fruit market ones are almost two feet long!) turnip greens, endive, collard, mustard, kale, escarole and romaine. They also are fed opuntia pads chopped up. Every mixed meal has at least one and usually two of the listed foods. In addition, a large carrot is turned into peels and added quite often Mixed in less often are asparagus, celery, spinach assorted little salad greens and green beans and other vegetables. I try for constant variety in the belief that every plant is probably a little different in terms of nutrient and trace element composition. Every now and then each tortoise is given a head of broccoli to enjoy. This is for beak trimming purposes. For the same reason I occasionally throw them a green plantain fruit. The largest tortoise can chew up a plantain, the others can dent it severely but are not able to consume it. 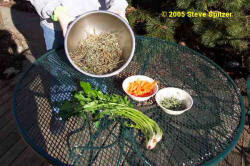 Winter squash are occasionally cooked and mixed with the tortoise salads, as are raw summer squash. My wife and I have a friendly relationship with the family owners of a Greek fruit and vegetable market. Throughout the year we will ask for a box of throw away greens and feed the tortoises large amounts of greens as their food for the day. These boxes are filled in the morning with whatever greens are less then perfect, usually outer leaves or leaves that are torn or wrinkled. Because the fruit market staff go throughout the store to spruce up the produce the boxes contain a good variety of plants. My tortoises are given calcium with vitamin D3 on an occasional basis. When they were small and rapidly growing they were given vitamins a couple of times a week, but for quite a few years they have been given vitamins less often. They are given calcium without D3 one or two times a week, usually a couple of ground up Tums. The only UVB light they have ever received indoors has come from Reptisun or Iguana 5.0 bulbs, or Vita Lites before ZooMed lights were invented. I throw them a cuttlebone now and then, but they ignore it. One of my tortoises was acquired with a flexible shell and this animal would try and eat rocks, but that stopped as she hardened up. The tortoises are kept in marine plywood boxes with eighteen inch high walls. One box is three by six feet, one four by six. These are not near as large as I would like or what is recommended for the animals, but are all there is room for. Because the cages are small, the animals are taken out for exercise during the winter months. Even though the boxes are small they do have a hot and cool end and a day/night temperature gradient. 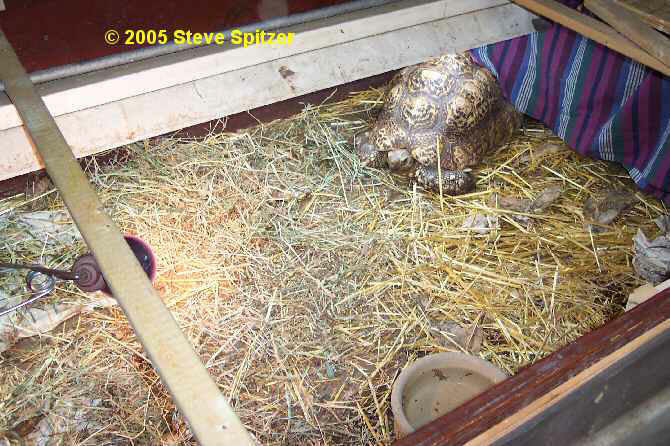 The tortoise boxes are in a mostly unheated basement where the winter temperature on a cold night can drop to below 60 degrees F. Because of this, my tortoise cages are built over a heated waterbed. Most of the tortoise care information sheets will say that bottom heat is not the recommended way to provide a hot spot for tortoises, and I agree with that. What I am doing with the water bed is controlling the low end temperature. The heated water bed is also insurance against drastic temperature drops due to a power outage, of which we have had a few in the eighteen years the bed has been in use. 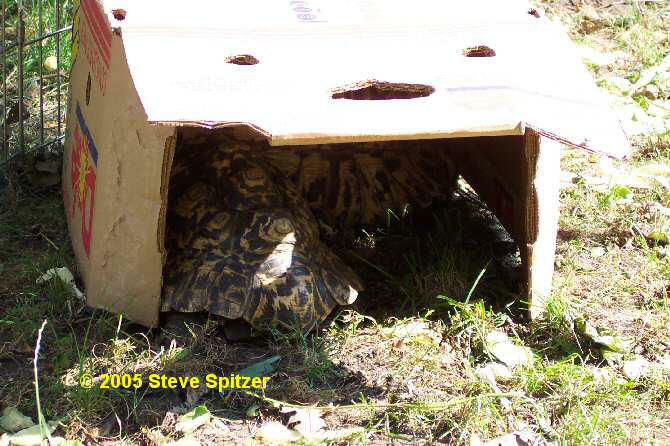 Our tortoise boxes are covered with sheets of insulation. Air flow is provided by having a small crack at each end of the box and a small hole cut into each end of the box. The air comes in the cold end and flows upwards and out the warm end. Each box has a four foot fluorescent light fixture in the box. Without any other heat used the fixture heat when on will increase the air temperature in the box five to ten degrees. In addition, a small flood light or ceramic heat emitter is used at one end of the box. At the other end of the box is a dark area provided by a piece of cloth hanging down almost to the floor and covering most of the width of the cage. This provides a cool area and is used for sleeping and for naps. The cool end temperature at mid-day is around 80 F, the hot spot is around 95 F.
Tortoises are given regular soaking, bowls of water now and then (they always dump them) and the cages and animals are misted when the air is overly dry during cold weather. 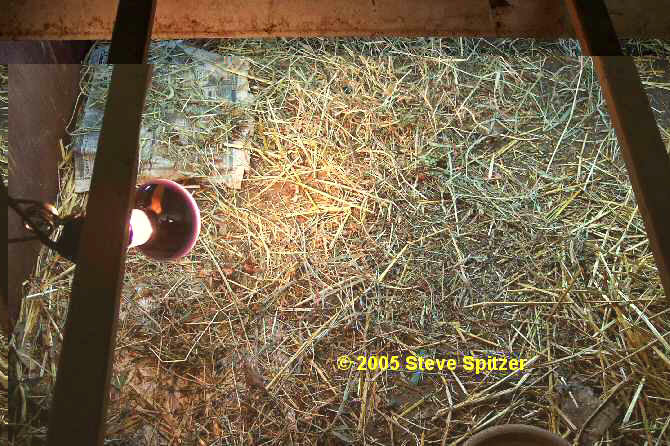 Cage floors have some straw or hay and newspaper on them and this is sprayed during winter months. During the summer a dehumidifier is running almost non-stop in the basement. This may be of benefit to the tortoises, but is definitely needed to protect anything stored in the basement as well as to keep the furnace from rusting. My tortoises are taken out often for school or museum reptile display sessions. They are transported in large coolers. School shows are usually short, but a museum show can last all day. Heat sources are provided sometimes at a museum, either an infrared emitter or a heat pad. The larger tortoises remain active and leave the heat source even if they drop down to an external temperature in the low 70s as measured on the shell with an infrared thermometer. When doing a show of long duration a bench or some other structure is used for a cave. Tortoises will go under the bench for awhile and then come out. At any show the tortoises are at food is provided. This may be long strips of cactus, green beans, endive or romaine. 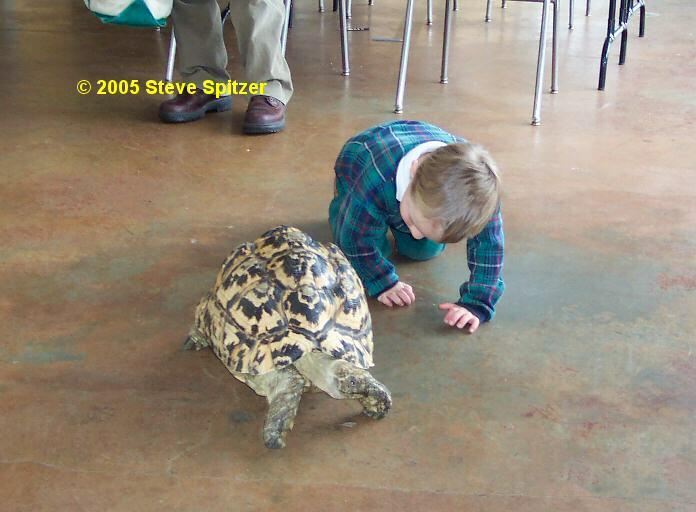 The criteria for show food is that it be long enough that students or visitors can hand feed the tortoises without having their fingers nipped. Although a tortoise may do a two day show, I rotate the animals so that there is at least a few weeks and usually more time between shows for any particular tortoise. Our show protocol includes liberal use of waterless hand sanitizer for exhibiters as well as audience members. The only other tortoises which come in contact with ours are three redfoot long term captives. Although mixing of species is not recommended, these particular tortoises and our leopards have mixed for many years with no adverse consequences. I mentioned at the beginning putting the tortoises out for brief periods of time even in cool weather. Something to keep in mind if you do this is that in the spring the sun may be quite warm, but the ground is only warm on the surface. If a tortoise goes in the shade or sits in one spot so the sun is not shining on the ground where they are at, they can cool off rapidly. For small tortoises a coldframe placed on a wood deck or porch will protect the animal from drafts and cold ground and provide an environment that is warmer then the surrounding air. Directions for coldframe construction can be found doing a web search, and they can be bought through garden supply companies. Ideally they should be higher in the back and slope towards the front, and the low front end should face the sun. Mine are over twenty-five years old and have oil filled openers which expand when warm for venting of excess heat. I do not know if these are still available. An upside down box with one end cut off will provide shade. 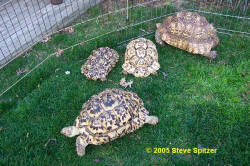 All four tortoises together to celebrate the coming of Spring. The clover comes up lush in Spring and is quickly eaten. From then on they only get picked field clover now and then. Fruit market greens boxes have a side cut out and are used for caves during summer. 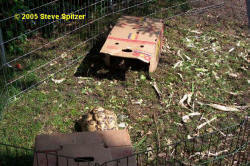 Two tortoises share a shady cave made from a greens box. Petunia after stepping onto a duckweed covered pond and being surprised. The lower portion of the wood structure is a heated waterbed on an insulated wood floor. 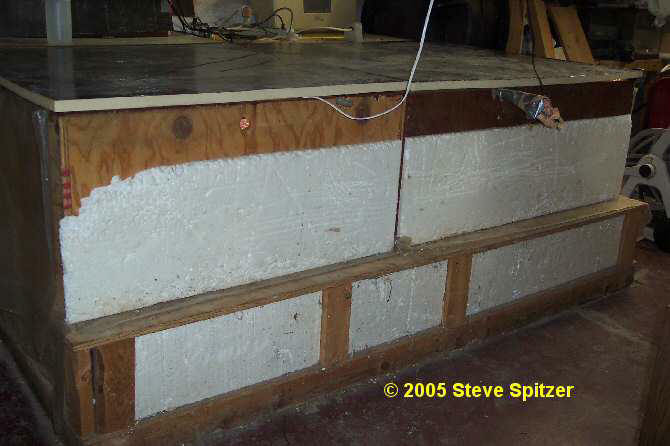 Boxes are covered with sheets of insulation. 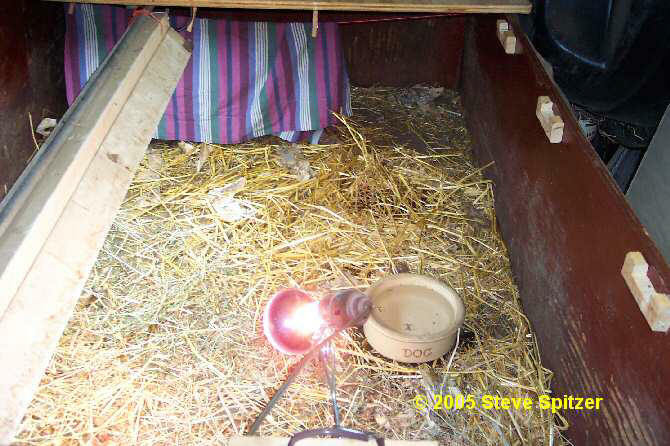 Although not shown in the picture, covers usually are positioned to leave a gap where cages meet for hot air venting. At far end of each cage there is a gap all along edge of cage for air intake. Long view of Petunia’s box. He sleeps behind colored cloth. The light visible in the front is a Chromalux bulb. The fluorescent fixture contains Reptisun 5.0 bulbs. The wood brackets are for cross braces so the cats do not break the cover. Another view of Petunia’s box. Petunia will sit under fluorescent tubes or go to hot spot in the morning, depending on how cold the box gets overnight. Petunia’s warm end. The newspaper in the corner is heavily sprayed and keeps humidity up. One day’s main meal for seventy pounds of tortoise. Hay chopped into two to three inch lengths in large bowl. One carrot in the form of peels. A small portion of alfalfa. One dandelion. Hay will be moistened before feeding. Tortoises sometimes are given an evening snack of a few greens in addition to main meal. Sheila travels in this cooler. She travels well, but if put in the cooler and ignored she wants to leave it. Sheila is racing an audience member at a museum. This is not the best floor for her.